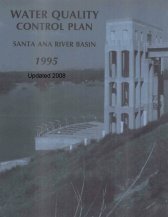 The 1995 Water Quality Control Plan for the Santa Ana River Basin (Region 8) was updated in February 2008, June 2011, and February 2016. Important! Please review Notes about the February 2008, June 2011, and February 2016 Basin Plan updates. Acrobat Reader is required to view the document. A link to download Acrobat Reader is available below. Some chapters are large an may take a few minutes to load, please be patient. The Santa Ana River Basin Water Quality Control Plan is also available to download as a zip file. It is all of the files listed above. The file is approxiamtely 12MB and a compression utility is needed to unzip and open. Basin Plan Maps - Maps showing all water bodies listed in the Water Quality Control plan for the Santa Ana River Basin - Regional 8, also known as the Basin Plan (draft work product, to be used for informational purposes only).